There was a great deal more to Italian painting in the 1800s than just the Macchiaioli. As with most European art outside Impressionism, we have lost sight of the history of painting in that century if it didn’t happen in Paris (or London, perhaps). One of its major influences was Domenico Morelli (1823–1901), whose precocious talent took him from his poor family in Naples to enroll in the Royal Academy of Fine Arts there in 1836. He started to win prizes in 1845, largely for his history and religious paintings. He went on to study in Rome in 1847-8, and on his return to Naples he joined the protestors of the 1848 insurrections in the city. When on the barricades, he was wounded, escaped death, and ended up in prison for a brief time. He returned to Rome, and was particularly successful at the Florentine Exposition and the Exposition Universelle in Paris in 1855. He then engaged in discussions with the members of the Macchiaioli concerning realism. In 1868, he was appointed professor at the Royal Institute of Fine Arts in Naples. He became interested in more religious and mystical themes, which embraced not only Christianity, but Jewish and Islamic traditions too. Very few of his paintings seem to be accessible now, so I apologise for the poor quality and small size of some of their images. 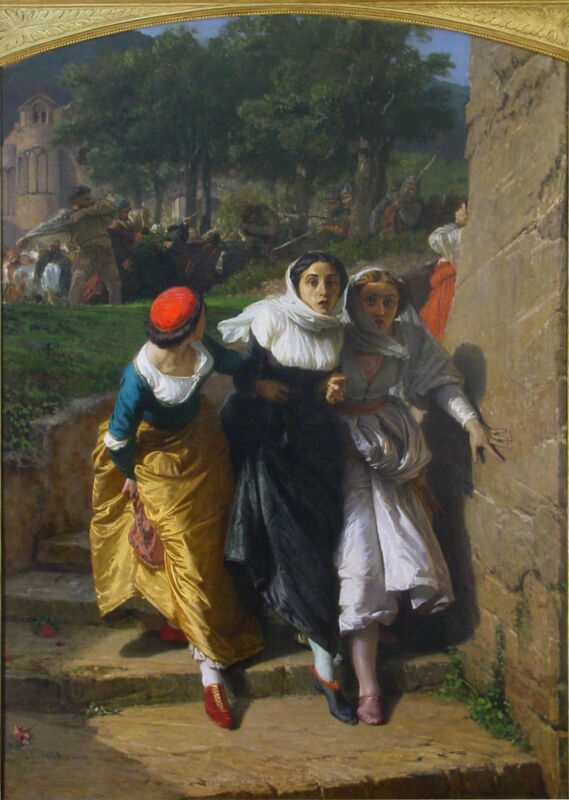 Domenico Morelli (1823–1901), Christian Martyrs (1851), oil on canvas, 160 × 213 cm, Museo nazionale di Capodimonte, Naples. Wikimedia Commons. 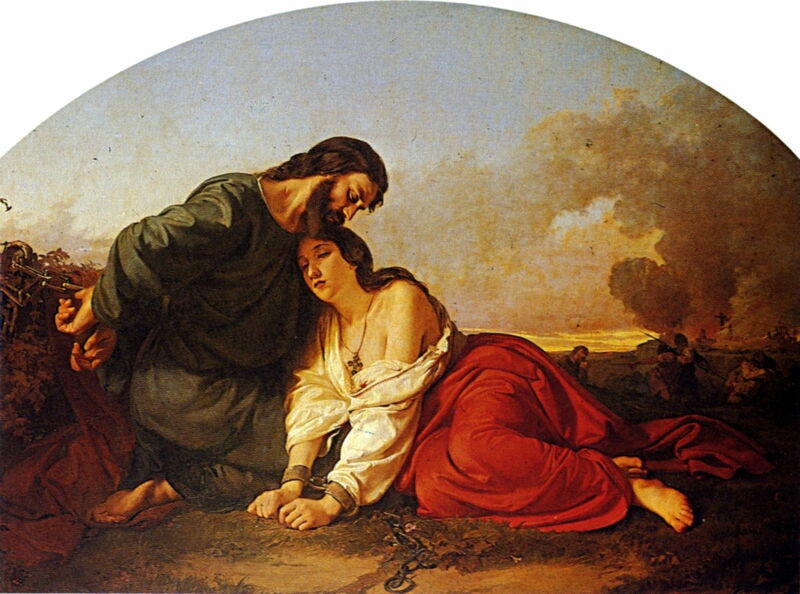 Christian Martyrs (1851) shows two presumably early Christians leaning against one another, their wrists chained together. In the background are hints of more graphic death: others are being rounded up and threatened with a spear, and a crucifix is seen from amid palls of smoke. But this couple could be asleep, or dead; Morelli leaves us to speculate over their fate. Domenico Morelli (1823–1901), The Ship of Life (1859), oil on canvas, 37 × 61.7 cm, Galleria d’Arte Moderna Paolo e Adele Giannoni, Novara, Italy. Wikimedia Commons. 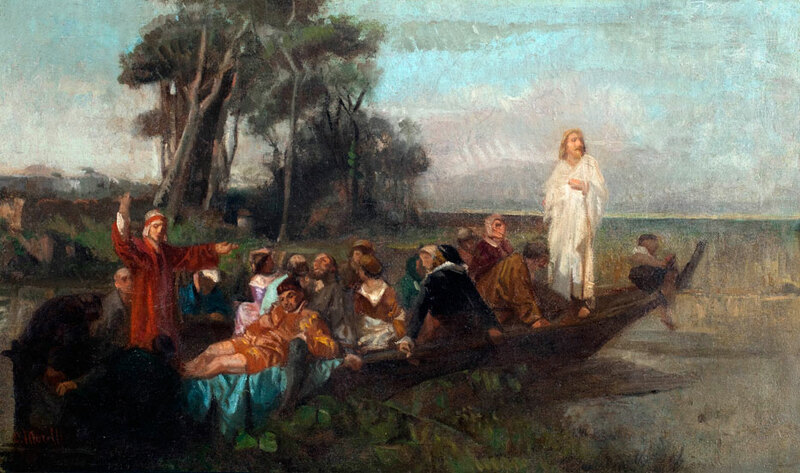 The Ship of Life (1859) refers to an enduring and popular Christian metaphor, in which God or Jesus Christ are asked to steer the person’s life away from sin and towards more peaceful times. Morelli may have had a specific poem in mind – there has been a very wide choice available. Jesus Christ is seen in white, standing in the bows of a boat crowded with people of all ages. At the stern, another figure (possibly John the Baptist) stands directing with his hands. 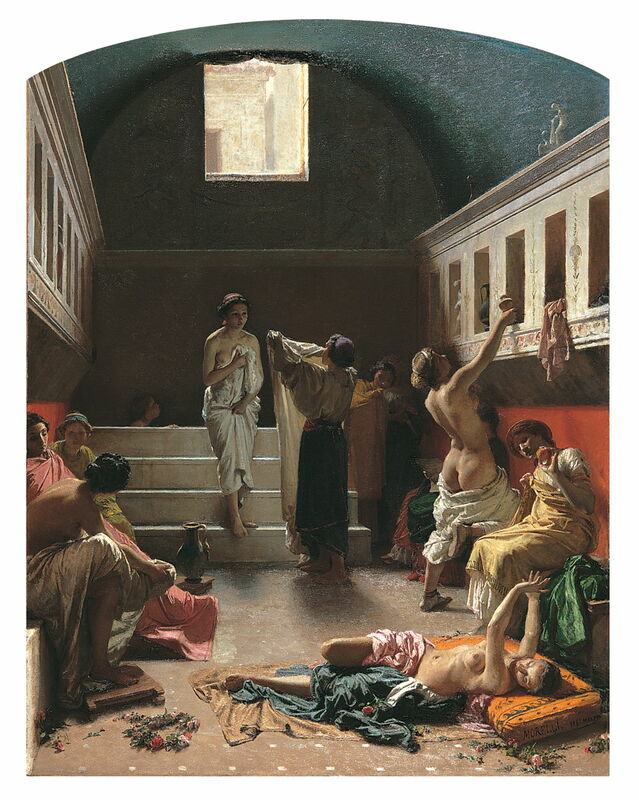 Domenico Morelli (1823–1901), The Pompeian Bath (1861), oil on canvas, 134.4 × 102.5 cm, Fondazione Internazionale Balzan, Milan. Wikimedia Commons. Morelli had particular interests in mediaeval and classical history. The Pompeian Bath (1861) is an exquisitely painted recreation of a scene from one of the baths of Pompeii, which was buried under tons of volcanic ash when Mount Vesuvius erupted in 79 CE. The ruins had been progressively excavated from their rediscovery in 1748; like Gérôme later in the 1800s, Morelli’s imagination was fired by archaeological discoveries. He also leaves us to speculate as to what the miniature sculpture on top of the cupboards at the right might show. 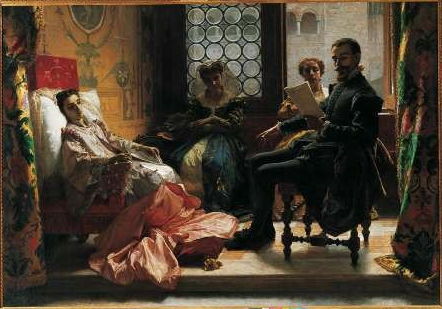 Domenico Morelli (1823–1901), Tasso Reads his Poem to Eleonora d’Este (1865), oil on canvas, dimensions and location not known. Wikimedia Commons. Tasso Reads his Poem to Eleonora d’Este (1865) is steeped in Italian literary and artistic history. Torquato Tasso (1544-1595) is now best-known for his epic poem La Gerusalemme Liberata (Jerusalem Delivered, 1581), which was a great influence on the paintings of Nicholas Poussin and others. As a young man, Tasso entered the service of the d’Este family in Ferrara, where he fell in love with one of Eleanora d’Este’s ladies-in-waiting. Tasso addressed his first series of love sonnets to her in 1562, only to fall in love with another of her retinue the following year. Eleonora d’Este (1537-1581) and her sister took Tasso under their protection, and he must have frequently read his poems to them, as shown in Morelli’s painting. His The Conversion of Saint Paul (1876) tackles a much better-known story. According to chapter 9 of the Acts of the Apostles, Saint Paul – then known as Saul – was a zealous Pharisee who was engaged in the intense persecution of early followers of Jesus Christ. In around 33-36 CE, when he was on his way from Jerusalem to Damascus in Syria, on a mission of persecution, he experienced a blinding light and the voice of Jesus, asking why he persecuted him. Saul then converted, becoming Saint Paul, one of the founding fathers of the early Christian church. This dramatic conversion has been a popular theme in painting, with versions known by Michelangelo, Bellini, Fra Bartolomeo, Caravaggio, and Rubens, for example. Morelli’s detailed realist version follows in their tradition, with the saint struck to the ground in a shaft of blinding light, although he is shown facing away from its heavenly source. That was Morelli’s solution to the compositional problem of showing the heavenly origin of the light, but at the same time showing the emotional impact in Paul’s facial expression, and giving clues to his subsequent temporary blindness. A topic for a future article, perhaps, Morelli seems to have arrived at a superior composition to the Masters of the past. 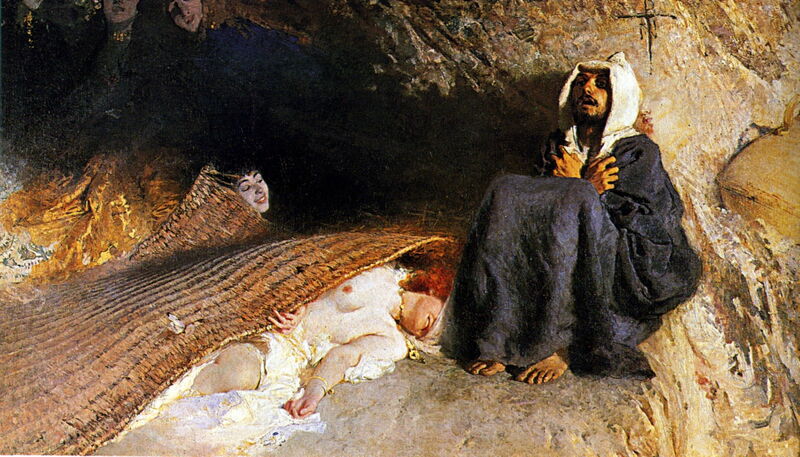 A couple of years later, Morelli painted this even starker version of another popular story from the lives of the saints, The Temptation of Saint Anthony (1878). He strips away the daemons and devils which had been embellishing earlier works, tucking Anthony’s temptresses under his sleeping mat. 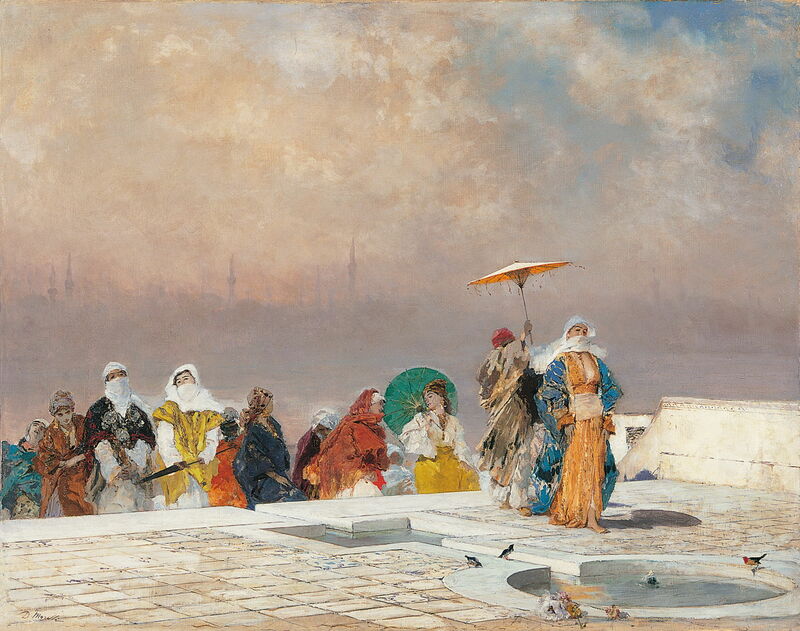 Domenico Morelli (1823–1901), The Sultan’s Wife Returns from her Bath (1877-83), oil on canvas, dimensions and location not known. Wikimedia Commons. One of Morelli’s most colourful and impressionistic paintings, his splendid The Sultan’s Wife Returns from her Bath (1877-83) is also one of the more secular of his ‘oriental’ works. Accompanied by an attendant holding a parasol, the Sultan’s wife swaggers barefoot over the palace tiles, the city enveloped in a sandy haze behind her. At an appropriate distance behind her, her retinue of women is making its way up the steps. In front her, by way of contrast, are four tiny colourful birds, one bathing in a shallow pond: these recall comparisons between human finery and the natural splendor of birds in the teachings of Jesus Christ and his followers. The Sermon of Mohammed (c 1895) is a very unusual painting in Western art, in depicting the Prophet Muhammad. Not only has this been culturally alien to the great majority of European painters, but making images of the Prophet is usually considered to be against religious law. Morelli tries to work around this by not showing the Prophet’s face. Indeed, in spite of the painting showing a host of followers, not a single face is shown. It is not clear whether Morelli intended this to be a specific sermon (khutbah), such as the most famous of them all, the Farewell Sermon, which was delivered on the ninth of Dhul Hijjah, ten years after the Hijrah, migration from Makkah to the Madinah, i.e. 6 March 632. That is accepted as having taken place during the Hajj in the Uranah Valley of Mount Arafat, which is a plausible interpretation of the location of this painting, although it would be more conventional perhaps to have pictured the Prophet on the mountain slopes. Domenico Morelli (1823–1901), The Angel of Death (1897), oil on canvas, 108 × 160 cm, Museo Nacional de Bellas Artes, Buenos Aires, Argentina. Courtesy of Museo Nacional de Bellas Artes, via Wikimedia Commons. 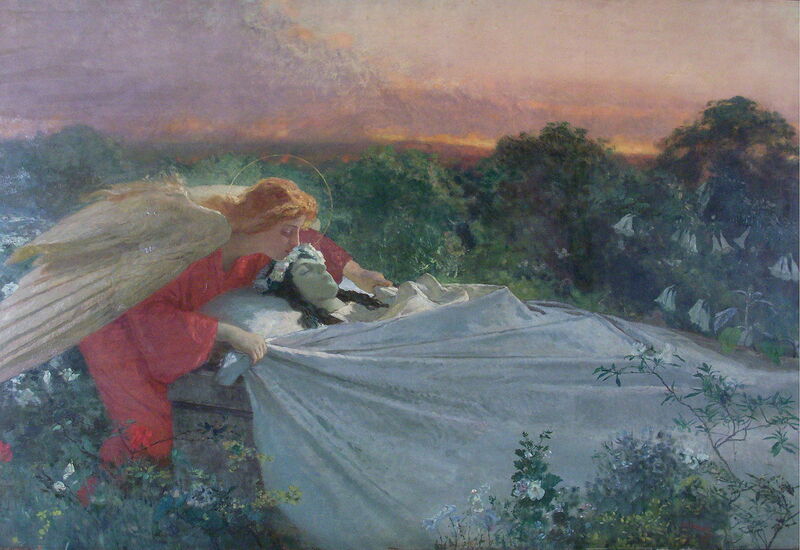 The Angel of Death (1897) is a much more typical painting of the late 1800s, showing a winged female angel tenderly drawing a white sheet over the body of a young woman who has just died. Domenico Morelli (1823–1901), Noah’s Thanksgiving after Leaving the Ark (date not known), oil on canvas, 27.5 × 40 cm, Private collection. Wikimedia Commons. Among Morelli’s last paintings was Noah’s Thanksgiving after Leaving the Ark (1901). This shows Noah from the Old Testament, with his family, giving thanks for their deliverance back to dry land after the flood abated. 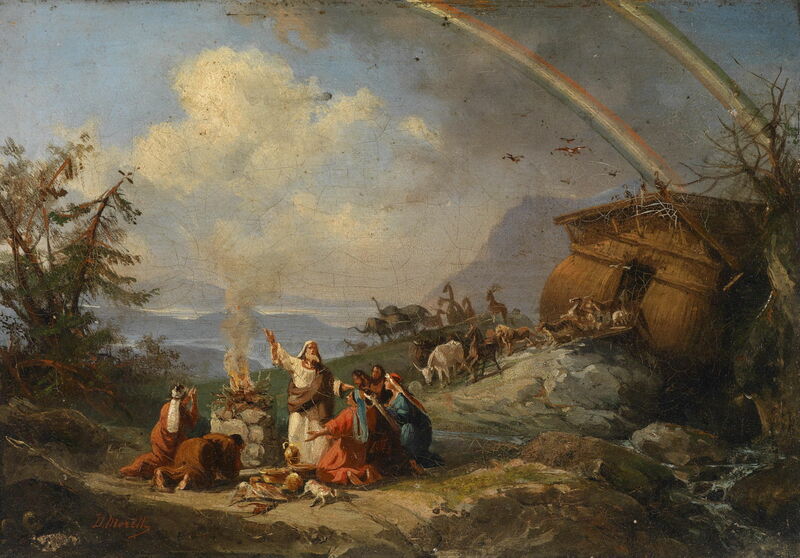 A double rainbow crosses the sky, and the pairs of animals which were saved on board the Ark are disembarking, as birds fly off into the distance. Domenico Morelli (1823–1901), Dante and Virgil entering Purgatory (date not known), oil on canvas, dimensions not known, location not known. Wikimedia Commons. Dante and Virgil entering Purgatory (date not known) shows a scene from the less well-known second part of Dante Alighieri’s Divine Comedy, Purgatory, written in the early 1300s. 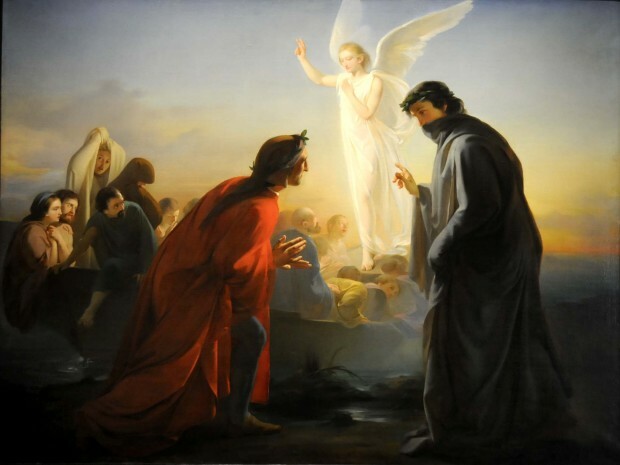 Purgatory is described as a mountain with seven levels of suffering and spiritual growth, by which the souls of the dead can attain the Earthly Paradise. Christian souls reach Purgatory by boat, crossing from a location near Ostia, at the mouth of the river Tiber, through the Pillars of Hercules, to the Mountain of Purgatory. Escorting them in the boat is an angel boatman, a marked contrast to Charon’s ferry across the Acheron to Hell. Dante and Virgil make this journey in Canto II of the book, as shown in Morelli’s painting. Domenico Morelli (1823–1901), Sicilian Vespers (date not known), oil on canvas, 264 × 85 cm, Museo nazionale di Capodimonte, Naples. Wikimedia Commons. Sicilian Vespers (date not known) refers to a rebellion which took place on Sicily at Easter, 1282, leading to the slaughter of French residents, loss of power by the government, and the start of the War of the Sicilian Vespers. At the time, Sicily was being ruled by King Charles I of Anjou. The King had little interest in Sicily, seeing it mainly as a base from which to launch attacks to seize the riches of Constantinople. The rebellion began at the start of Vespers sunset prayers on Easter Monday, 30 March 1282, at a church just outside Palermo. This seems to have started in an altercation over a woman, resulting in one of the occupying French soldiers being killed. This escalated rapidly, and within six weeks three thousand French men and women were killed. Morelli shows the other side of the story. Three women are seen, holding one another for safety, as they flee from the opening blows between French soldiers and Sicilians. Hitching their skirts up so that they can walk at speed, these three look anxious, as if they have just noticed that they are walking towards more French soldiers. From the limited range of his paintings now accessible, Domenico Morelli was highly skilled in telling stories, and his compositional solution to the problems of The Conversion of Saint Paul stand out as a remarkable achievement. However the historical narratives which he chose were obscure, subtle, or both. His interest in religions beyond Christianity was exciting, but at the time was probably unpopular. We are in dire need of good information about Morelli’s paintings, and more images of them. Posted in General, Painting and tagged Gérôme, Italy, Macchiaioli, Morelli, narrative, painting, Poussin, Tasso. Bookmark the permalink.